We are about three weeks in to this year's gardening season, if you count the beginning of the season as when we first planted the seeds indoors. With a new camera finally in my possession, I was able to capture the status of the seeds at 3 weeks, including the latest milestone - the first (albeit tiny) true leaves! The tomatoes are doing quite well. A few of them have shriveled a bit for reasons unknown, since they all get the same amount of water and generally the same amount of light. But we planted more than we'll need for that reason. After the germination, we had some issues with the plants on the outer edges reaching inward for light, but they seem to have straightened after we starting rotating the trays. 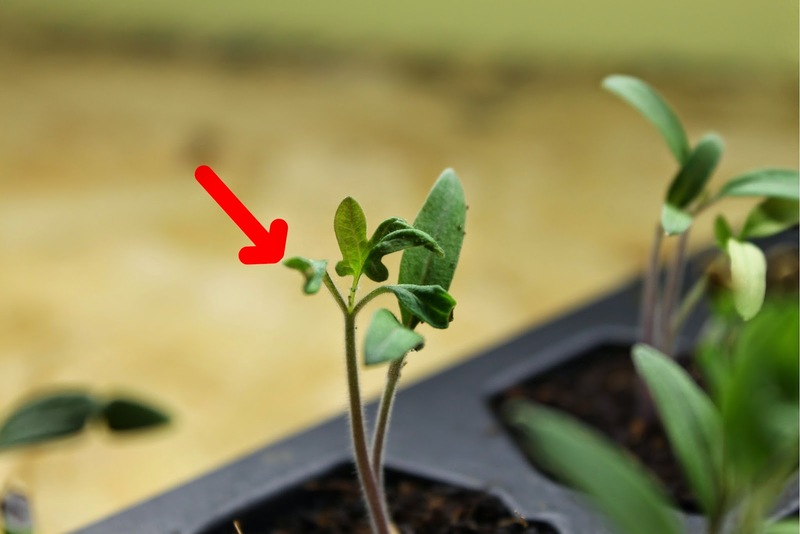 It's one of the tomato plants that has shown its first true leaves. Blink and you'll miss it, but it's there! True leaves are the first leaves that actually look like the ones the adult plant will have. Usually it's the third leaf that splits off from the two that begin. True leaves, once they're developed, mean that you can move the seedlings to larger containers if needed and begin using some fertilizer. We use organic gardening methods, so we'll be using some type of organic fertilizer. Most of the seedlings don't have true leaves yet, but they're coming! The best part is that our seedlings barely got to the true leaf stage last year indoors. We didn't have the greatest luck with seedlings last year (primarily due to insufficient light), so really any progress indoors is good progress for us. Ideally we end up with so many healthy seedlings that we have to give them away for lack of bed space! Some herbs are coming along pretty well too. Others, not so much. Peppers are also coming along well. No true leaves yet, but like the tomatoes, the vast majority of the seedlings look healthy and strong. I think we're also learning about the merits of the trays we are using - the watering process is working out relatively well. We water from below in the trays, and also spritz the seedlings with water as needed. We do it at night when we turn the grow lights off, so avoid burning the seedlings with the water under light. Seems to be working, save for a few brown/dry pieces here and there. And last but not least, because it was 70 degrees yesterday and the sun was shining and I had a camera, a gratuitous shot of the first flowers to peek up from our front bed. Spring really is coming. How are your seedlings doing? Any true leaves?